While both forward and futures derivative contracts help reduce losses, the latter are preferable as they carry lower risk and are more liquid. Expectations play a crucial role in investment decisions and have a direct bearing on the prices of asset classes. As expectations change, prices fluctuate, exposing investments to risks. To help mitigate these risks, traders resort to derivatives. These instruments help lock in future prices, thereby reducing losses and, hence, the risk. 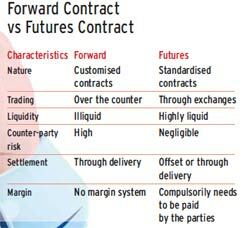 While there are several variants of derivative contracts, we examine the ones used most commonly - forward and futures. It is an agreement to buy or sell an asset on a specified date at a predetermined price. One of the parties assumes a long position and agrees to buy and the other adopts a short position and agrees to sell. These are non-standardised contracts and the parties negotiate bilaterally. However, forward contracts have several limitations. The parties are highly susceptible to counter-party risk and the contracts are illiquid. It is also an agreement to buy or sell a fixed quantity of a specified asset on a particular date. Unlike forward contracts, these are standardised and can be traded on exchanges. The exchange sets the contract details, such as the quantity and quality of asset, facilitates liquidity and eliminates counterparty risk. The transactions are conducted through a clearing house, which ensures that both parties fulfil their obligations. The assets for which futures contracts are available in India include stocks, market indices, interest rates, currencies and commodities. Let us consider some examples. Short futures: A farmer expects to harvest 1,500 kg of wheat to sell after a month. However, its price is likely to decline substantially in the short term. A futures contract on wheat is available at Rs 25 per kg and the contract size is 100 kg. He can lock in the price at Rs 25 by going short in 15 contracts. He ensures that he will receive Rs 37,500 irrespective of the price variation. However, if the price rises, he will not benefit. Long futures: A trader has imported goods worth $10,000 from Chicago and is required to make the payment after a month. But the dollar is expected to strengthen during this period. A currency futures contract is available at Rs 45. If the contract size is $1,000, he can take a long position in 10 contracts. He can lock in on Rs 4.5 lakh and safeguard himself against an appreciation. However, he will not gain if the dollar depreciates.